This past week, Arkansas head coach Bret Bielema made news when he knocked Ohio State’s strength of schedule. Current or former Wisconsin sports coaches have not had very nice things to say about Ohio State. Bo Ryan’s “deal with it!” has made him a foremost enemy of Buckeye Nation, and Bielema, formerly at Wisconsin, is also a much-loathed figure in the state of Ohio. Last week’s remarks were par for the course. TSS associate editor Terry Johnson outlined all the good things Toledo did to make this happen, and that should rightly be seen as the centerpiece of Saturday’s big story. However, there’s another reason Arkansas lost that game. That reason is named Bret Bielema. It’s a problem for a lot of coaches — it happens every weekend during each season — and it’s something these highly-paid professionals have to address: When you’re trailing inside the final two or three minutes, and you face a fourth down while having all three timeouts left, you NEED TO KEEP ALL THREE TIMEOUTS and avoid the easy inclination to use that first timeout before the fourth-down play. You might want to get that fourth-down play just right, but if you fail, having all three timeouts ensures that your opponent can’t burn more than 15 to 20 seconds off the clock. Spending one of your timeouts before a fourth-down play which might not work costs you at least 45 seconds. Bielema and his staff were not able to pass this endgame-management test against Toledo. Near the two-minute mark of regulation, with Arkansas trailing by a 16-10 count, the Razorbacks faced fourth down and had three timeouts… until Bielema used one of them. Sure enough, Toledo was able to burn about 50 seconds on third down (after Arkansas burned its remaining timeouts following first and second down), and six more seconds in the process of taking a smart and appropriate safety. Given that Arkansas reached the Toledo 16 with six seconds left and was able to run two plays from the 16, it’s pretty reasonable to say that with 50 more seconds available, the outcome of the game might have been different. 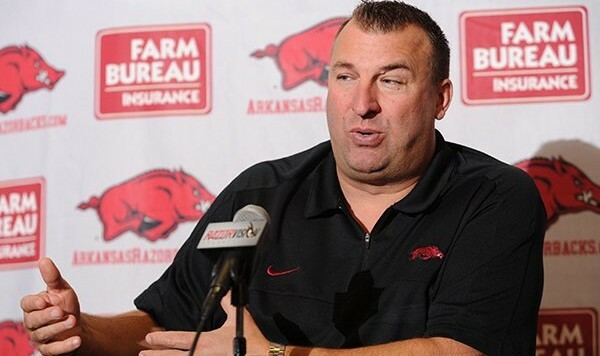 Bielema lost sight of the need to make sure that he had three clock-stopping poker chips in his pocket when his team failed on fourth down near the two-minute mark of regulation. Coaches have to go over this situation in practice and in weekly meetings. They must stress to their assistants and players that they need to have fourth-down plays ready to go in various situations, instead of feeling they have to confer about them on the sidelines during a timeout. There is, however, an exception to this general principle. If some circumstance makes it absolutely necessary for a coach to use the first of his three timeouts in this kind of time-and-score (and timeout) situation, the normal rules go out the window. Such was the case in the Notre Dame-Virginia game on Saturday. Given the fact that Notre Dame’s starting quarterback, Malik Zaire, was knocked out of the contest with an injury, backup quarterback DeShone Kizer had to step in. When Notre Dame faced a fourth down with three timeouts left and time ticking down, the need to have a backup quarterback fully prepared to run the right play represented a legitimate need for Brian Kelly. If Zaire had been in the game, Kelly should have been able to trust his guy to make a play. However, with Kizer thrust into a pressure cooker, taking that timeout was warranted. This situation in Charlottesville was certainly the exception which proved the rule. Bret Bielema might want to focus on coaching better, instead of worrying about other teams’ problems. Matt Zemek is the managing editor of The Student Section, covering college football and basketball with associate editors Terry Johnson and Bart Doan. Mr. Zemek is the editor of Crossover Chronicles, covering the NBA. He is also Bloguin's lead tennis writer, covering the major tournaments. He contributes to other Bloguin sites, such as The AP Party. Copyright © 2016 www.thecomeback.com/TheStudentSection - All Rights Reserved - Trademarks used herein are property of their respective owners. thecomeback.com/TheStudentSection is part of the NESN digital network.